Wood River High School senior Cheyenne Swanson, in her fourth year of varsity throwing for the Wolverines, captured her first Great Basin Conference shotput title Wednesday during the first day of the two-day 4th District 4A finals at Burley High. Swanson, bound for Tulane University in New Orleans, La. in the fall on an academic scholarship, won the shotput finals by nearly two feet with a throw of 36 feet and 8.5 inches. Her personal best shotput was 36-10.75 established at the Angie Wyatt meet in Filer April 6. The two time defending State 4A discus champion, Swanson is now headed to the State 4A meet for the third year in the shotput event. 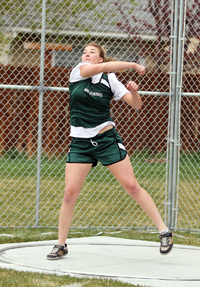 She competed in the discus Thursday at Burley, trying to nab her first-ever district title in that event as well. She plans to compete at Tulane in track and field.